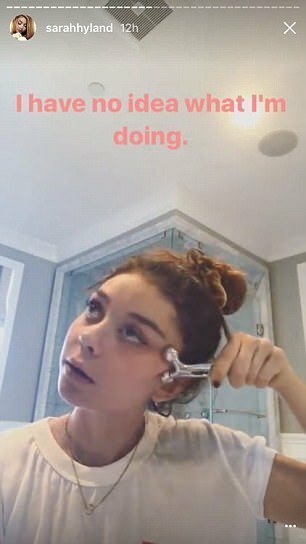 Modern Family star Sarah Hyland has opened up to her fans about one of the common side effects she still deals with five years after her kidney transplant. The 26-year-old actress received a kidney from her father in 2012 to cure a condition called dysplasia, when the organs do not develop properly. Now, she is on a habitual dose of prednisone, an immunosuppressant steroid to prevent organ rejection and infections. One of the common but harmless side effects is known as ‘moon face’ swelling. 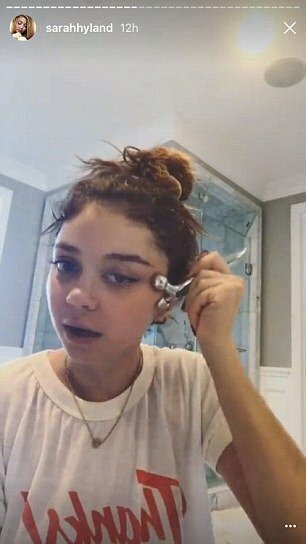 On Saturday, Hyland posted an Instagram Story laying out how she deals with this on a day-to-day basis while juggling her career. 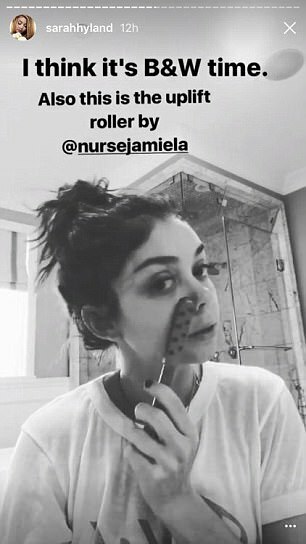 It involves a facial serum and a massage roller that she pushes over her face. ‘I use this thing to roll my face out. I don’t know if it works or not,’ she told viewers. Prednisone is one of many steroid drugs which lower the activity of the immune system. This slow’s down the body’s natural reaction time to target an infection or disease, which can sometimes lead to the body rejecting a new organ after it was transplanted. It can also treat other kidney diseases, including lupus, and help lower symptoms like inflammation and swelling. However, it comes with some debilitating side effects including mood changes, acne, exhaustion, weight gain, weight loss, changes in appetite, and swelling of the face, legs, feet and hands. Healthcare providers recommend that patients limit their salt and sugar intake to improve their symptoms. But that can only have a marginal affect. There is no evidence that rollers do anything to the fat aside from massaging it. But experts say that anything to make the patient feel better are positive. 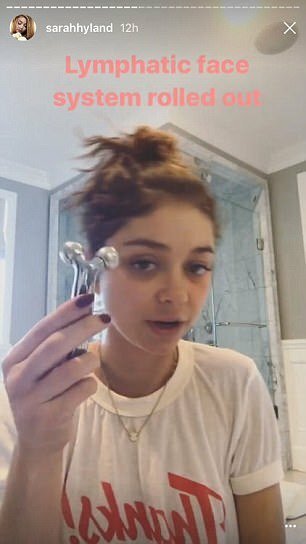 This is hardly the first time Hyland has vocalized her experience with prednisone. In May this year, she hit back at the streams of people on Twitter branding her ‘anorexic’. In a lengthy post, she outlined why her weight loss – and facial swelling – is the result of her life-saving surgery. ‘My circumstances have put me in a place where I’m not in control of what my body looks like,’ she tweeted, explaining that she was on bed rest for seven months due to loss of muscle mass. ‘I have been told that I can’t work out. Which, for me, is very upsetting’ she posted.